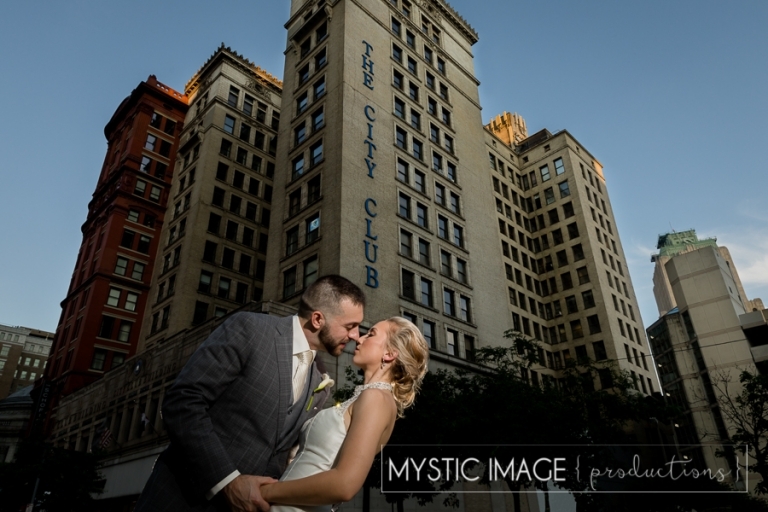 We are absolutely delighted to share some of the amazing images from Louisa and Matt’s summer wedding day at the Cathedral of St. John the Evangelist followed by their reception at The City Club of Cleveland! We had the pleasure of shooting Louisa and Matt’s engagement session back in February on a day when we were experiencing a true Cleveland winter. The frigid temperatures and rain kept us indoors for our entire session; however, this would not be the case on their wedding day. To say that the weather on their special day was uncomfortable would be a total understatement. I honestly can’t remember a time when it was so hot and humid out that people simply stayed indoors, but this absolutely worked in our favor. It was like we had downtown all to ourselves. And did I mention how amazing everyone in their bridal party was? What troopers!!! Regardless of the heat, these two were able to keep their cool throughout the entire day. Yes, there were the typical “wedding day jitters” but nothing that true love and support of friends and family couldn’t overcome. The boundless laughter and happy tears that day were simply beautiful and totally contagious. From their gorgeous wedding ceremony, to our seamless photo session, to their intimate reception at The City Club everything was totally on point and just seemed to keep going our way. It truly was the perfect day.